This All About Rabbits page is a catalog of rabbit-breeder-tested-and-proven online and printed resources to help you care for, understand, and manage your rabbits’ care and health. The following websites are owned, run, and/or managed by respected and reliable rabbit breeders who know rabbit husbandry inside and out. These are websites and breeders that intimately understand the meaning of "animal welfare" (as opposed to animal rights - see https://www.raising-rabbits.com/against-animal-rights.html for clarification, if necessary). Barbi Brown has tons of useful info both older and newer. She pushes the limits of "hobby" into the commercial, raising multiple individuals of multiple breeds for multiple purposes. She knows her stuff. This is a great site for breed info, list links, etc., managed by Mr. Franco Rios. Mr. Rios keeps track of the rare and heritage breeds. The Nature Trail has many educational articles, including showing, rabbit care, breeding, rabbit genetics, and more. They specialize in the very popular Holland Lop breed. This site touches on a multitude of meat rabbit raising guidelines. For example, their section on "What About Pasturing?" is spot-on. 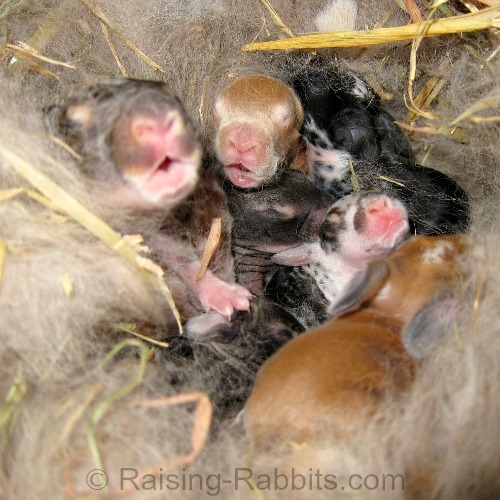 These are breeders of Holland Lops and Jersey Woolys. This website is strong in education for 4H, showing, and overall rabbit care. This site supports angora rabbit breeders with info, a blog, and educational articles about the special care needs of long-wooled angora rabbits. The above sites all touch to some degree on rabbit diseases. If you want to go deeper, take a look at these links. For those who need it, the Merck Veterinary Manual has lots of rabbit information. https://www.raising-rabbits.com/rabbit-diseases.html - we’ve drawn from our own well of experience (some of it hard-earned) and from extensive research to present a fairly comprehensive rabbit health and disease resource for all rabbit owners. We don’t know any rabbit breeders or pet rabbit owners that don’t want to give excellent care to their rabbits. All folks need is accurate information and the want-to. Meatrabbits Yahoo! Group There is a wealth of personal (and even professional) experience in this very large and active group. You do NOT have to raise meat rabbits to be a part of the list. Try the Herbal Rabbit Group to learn and share herbal or natural remedies or feeding methods for your rabbits. Raising meat pens - groups of 3 nearly identical young rabbits to demonstrate conformity and quality in meat rabbits - is governed by specific rules. Those entering County Fairs and Rabbit Show Meat Pen competitions can check here for the particulars. Another resource on Meat Pens. Having trouble finding what you're looking for somewhere on Raising-Rabbits.com? Try using the custom website search bars, located near the top of most of our pages, such as this one. If you're still stymied, we'd be pretty shocked if you didn't find what you needed somewhere else on either Raising-Rabbits or one of these excellent sites on the World Wide Web. 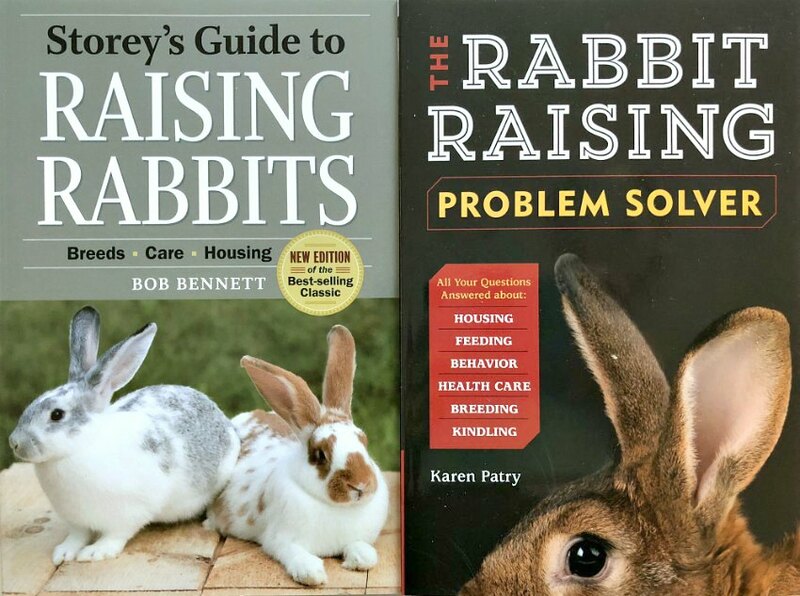 Karen's Rabbit Raising Problem Solver and Bob Bennett's Storey's Guide to Raising Rabbits (4th Edition), both published by Storey Publications, complement each other. Between both books, you'll find no stone unturned! 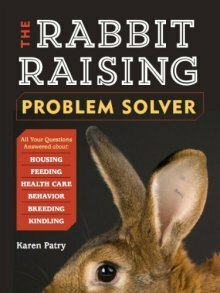 Written by Karen, owner of Aurora Rex Rabbit Ranch, and owner and webmaster of Raising-Rabbits, it is a Q&A format book that answers nearly every pet rabbit or breeder question we've ever encountered here on Raising-Rabbits.com. Click on the link above for more info on this excellent resource, or purchase on this page. That said, we clearly know there's much more rabbit raising info out there other than what we can include on this website, and the above list of great websites should prove that assertion. Here are some of our other favorite rabbit resources, top notch books that are all about rabbits and their care. Any rabbit breeder that lives farther than 50 miles or one hour from a very good rabbit-savvy vet might seriously consider keeping a book or two of this sort on their rabbit resource shelf. Textbook of Rabbit Medicine, by Frances Harcourt-Brown. A top-notch resource, if you're into learning all you can learn about rabbits, including the gory details. Though a bit pricy, it might be worth it if you live far from a rabbit-savvy vet and need to manage your own rabbit emergencies. Rabbit Production by McNitt, et al. Occasionally referred to as the Rabbit Bible, it is an invaluable resource even for pet rabbit owners who want to know the nitty gritty about overall rabbit care, diseases, genetics and much more. The Nervous New Owners Guide to Angoras - a great resource since caring for long-haired angora breeds comes with its own set of unique challenges (and we raise the very short-haired Rex). Yeah, get the book. Storey’s Guide to Raising Rabbits, the classic by Bob Bennett. This is another tried and true source that is all about rabbit raising. Many breeders cut their teeth on this book, including us.